1 January 1989 if 11 states have ratified by then. Retrospective video on the Montreal Protocol and the collaboration between policy makers, scientists, and industry leaders to regulate CFCs. The Montreal Protocol on Substances that Deplete the Ozone Layer (a protocol to the Vienna Convention for the Protection of the Ozone Layer) is an international treaty designed to protect the ozone layer by phasing out the production of numerous substances that are responsible for ozone depletion. It was agreed on 26 August 1987, and entered into force on 26 August 1989, followed by a first meeting in Helsinki, May 1989. Since then, it has undergone eight revisions, in 1990 (London), 1991 (Nairobi), 1992 (Copenhagen), 1993 (Bangkok), 1995 (Vienna), 1997 (Montreal), 1998 (Australia), 1999 (Beijing) and 2016 (Kigali, adopted, but not in force). As a result of the international agreement, the ozone hole in Antarctica is slowly recovering. Climate projections indicate that the ozone layer will return to 1980 levels between 2050 and 2070. Due to its widespread adoption and implementation it has been hailed as an example of exceptional international co-operation, with Kofi Annan quoted as saying that "perhaps the single most successful international agreement to date has been the Montreal Protocol". In comparison, effective burden sharing and solution proposals mitigating regional conflicts of interest have been among the success factors for the Ozone depletion challenge, where global regulation based on the Kyoto Protocol has failed to do so. In this case of the ozone depletion challenge, there was global regulation already being installed before a scientific consensus was established. Also, overall public opinion was convinced of possible imminent risks. The two ozone treaties have been ratified by 197 parties, which includes 196 states and the European Union, making them the first universally ratified treaties in United Nations history. These truly universal treaties have also been remarkable in the expedience of the policy making process at the global scale, where bare 14 years lapsed between a basic scientific research discovery (1973) and the international agreement signed (1985 & 1987). When comparing this very success story with attempts to establish an international policy on the Earth's climate or atomic energy, the entire process from a problem formulation to a global acceptance supported by a legal framework took less than a quarter of a single human generation life span. For each group of ODSs, the treaty provides a timetable on which the production of those substances must be shot out and eventually eliminated. There was a faster phase-out of halon-1211, -2402, -1301, There was a slower phase-out (to zero by 2010) of other substances (halon 1211, 1301, 2402; CFCs 13, 111, 112, etc.) and some chemicals were given individual attention (Carbon tetrachloride; 1,1,1-trichloroethane). The phasing-out of the less damaging HCFCs only began in 1996 and will go on until a complete phasing-out is achieved by 2030. The provisions of the Protocol include the requirement that the Parties to the Protocol base their future decisions on the current scientific, environmental, technical, and economic information that is assessed through panels drawn from the worldwide expert communities. To provide that input to the decision-making process, advances in understanding on these topics were assessed in 1989, 1991, 1994, 1998 and 2002 in a series of reports entitled Scientific assessment of ozone depletion. Under the Montreal Protocol on Substances that Deplete the Ozone Layer, especially Executive Committee (ExCom) 53/37 and ExCom 54/39, Parties to this Protocol agreed to set year 2013 as the time to freeze the consumption and production of HCFCs. They also agreed to start reducing its consumption and production in 2015. The time of freezing and reducing HCFCs is then known as 2013-2015. Produced mostly in developed countries, hydrofluorocarbons (HFCs) replaced CFCs and HCFCs. HFCs pose no harm to the ozone layer because, unlike CFCs and HCFCs, they do not contain chlorine. They are however greenhouse gases, with a high global warming potential (GWP), comparable to that of CFCs and HCFCs. The Montreal Protocol as it is currently in effect does not currently address HFCs, but these substances figure in the basket of six greenhouse gases under the Kyoto Protocol. Developed countries following the Kyoto Protocol report their HFC emission data to the UNFCCC; parties to the Montreal Protocol have no such obligation. In November 2015 in Dubai, at the 27th Meeting of Parties of the Montreal Protocol, the 197 countries and other parties which participate in the Montreal Protocol agreed to begin working on an amendment to the Protocol which will reduce production and consumption of HFCs. On 15 October 2016, negotiators from over 170 nations meeting at the summit of the United Nations Environment Programme reached a legally-binding accord to phase out hydrofluorocarbons (HFCs) in an amendment to the Montreal Protocol. The amendment has not entered into force. 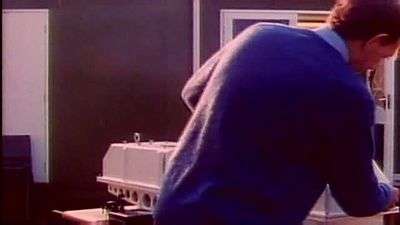 Then, in 1985, British Antarctic Survey scientists Joe Farman, Brian Gardiner and Jonathan Shanklin published results of abnormally low ozone concentrations above Halley Bay near the South Pole. They speculated that this was connected to increased levels of CFCs in the atmosphere. It took several other attempts to establish the Antarctic losses as real and significant, especially after NASA had retrieved matching data from its satellite recordings. The impact of these studies, the metaphor 'ozone hole', and the colourful visual representation in a time lapse animation proved shocking enough for negotiators in Montreal to take the issue seriously. Also in 1985, 20 nations, including most of the major CFC producers, signed the Vienna Convention, which established a framework for negotiating international regulations on ozone-depleting substances. After the discovery of the ozone hole it only took 18 months to reach a binding agreement in Montreal. United Nations Environment Programme (UNEP), through the UNEP DTIE OzonAction Programme. As of 23 June 2015, all countries in the United Nations, the Cook Islands, Holy See, Niue and the supranational European Union have ratified the original Montreal Protocol (see external link below), South Sudan being the last country to ratify the agreement, bringing the total to 197. These countries have also ratified the London, Copenhagen, Montreal, and Beijing amendments. Since the Montreal Protocol came into effect, the atmospheric concentrations of the most important chlorofluorocarbons and related chlorinated hydrocarbons have either leveled off or decreased. Halon concentrations have continued to increase, as the halons presently stored in fire extinguishers are released, but their rate of increase has slowed and their abundances are expected to begin to decline by about 2020. Also, the concentration of the HCFCs increased drastically at least partly because for many uses (e.g. used as solvents or refrigerating agents) CFCs were substituted with HCFCs. While there have been reports of attempts by individuals to circumvent the ban, e.g. by smuggling CFCs from undeveloped to developed nations, the overall level of compliance has been high. Statistical analysis from 2010 show a clear positive signal from the Montreal Protocol to the stratospheric ozone. In consequence, the Montreal Protocol has often been called the most successful international environmental agreement to date. In a 2001 report, NASA found the ozone thinning over Antarctica had remained the same thickness for the previous three years, however in 2003 the ozone hole grew to its second largest size. The most recent (2006) scientific evaluation of the effects of the Montreal Protocol states, "The Montreal Protocol is working: There is clear evidence of a decrease in the atmospheric burden of ozone-depleting substances and some early signs of stratospheric ozone recovery." However, the hydrochlorofluorocarbons, or HCFCs, and hydrofluorocarbons, or HFCs, are now thought to contribute to anthropogenic global warming. On a molecule-for-molecule basis, these compounds are up to 10,000 times more potent greenhouse gases than carbon dioxide. The Montreal Protocol currently calls for a complete phase-out of HCFCs by 2030, but does not place any restriction on HFCs. Since the CFCs themselves are equally powerful greenhouse gases, the mere substitution of HFCs for CFCs does not significantly increase the rate of anthropogenic global warming, but over time a steady increase in their use could increase the danger that human activity will change the climate. Within 25 years of signing, Parties to the MP celebrate significant milestones; however, the job is not yet done and the current moment could not be more pivotal for accomplishing its vital mission. Significantly, the world has phased-out 98% of the Ozone-Depleting Substances (ODS) contained in nearly 100 hazardous chemicals worldwide; every country is in compliance with stringent obligations; and, the MP has achieved the status of the first global regime with universal ratification; even the newest member state, South Sudan, ratified in 2013. UNEP received accolades for achieving global consensus that "demonstrates the world’s commitment to ozone protection, and more broadly, to global environmental protection". ↑ "Adjustments to the Montreal Protocol". United Nations Environment Programme Ozone Secretariat. ↑ Ewenfeldt B, "Ozonlagret mår bättre", Arbetarbladet 12-9-2014, p. 10. ↑ "Ozone Layer on Track to Recovery: Success Story Should Encourage Action on Climate". UNEP. UNEP. 10 September 2014. Retrieved 18 September 2014. ↑ Susan Solomon; Anne R. Douglass; Paul A. Newman (July 2014). "The Antarctic ozone hole: An update". Physics today. Retrieved 18 September 2014. 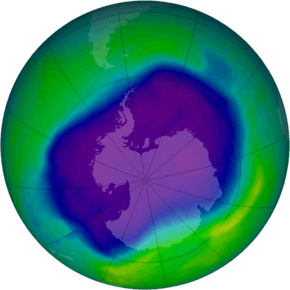 ↑ "The Ozone Hole-The Montreal Protocol on Substances that Deplete the Ozone Layer". Theozonehole.com. 16 September 1987. 1 2 "Status of Ratification – The Ozone Secretariat". Ozone.unep.org. ↑ "UNEP press release: "South Sudan Joins Montreal Protocol and Commits to Phasing Out Ozone-Damaging Substances"". Unep.org. ↑ "Class I Ozone-depleting Substances | Science | Ozone Layer Protection | US EPA". Epa.gov. ↑ "Climate of irrationality". Down To Earth. 18 September 2012. ↑ Rajecki, Ron (23 Nov 2015). 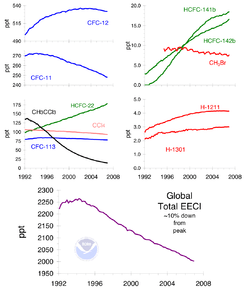 "Montreal Protocol Sets Global HFC Phasedown". ACHR News. BNP Media. Retrieved 10 Jan 2016. ↑ Article "The way forward. Second-best solutions", The Economist, special report on "Climate change", 28 November 2015, page 15-16. ↑ Doyle, Jack (October 1991). "DuPont's Disgraceful Deeds: The Environmental Record of E.I. DuPont de Nemour". The Multinational Monitor. 12 (10). The Multinational Monitor. Retrieved 8 September 2014. ↑ "Du Pont: A Case Study In the 3D Corporate Strategy". Greenpeace. 1997. Archived from the original on 2012-04-06. Retrieved 8 September 2014. ↑ Creating a real change for the environment. Secretariat of the Multilateral Fund for the Implementation of the Montreal Protocol. 2007. ↑ "EUROPA – PRESS RELEASES – Press Release – Environment: European Union hails universal ratification of the Montreal Protocol on protecting the ozone layer". Europa.eu. ↑ Archived 14 June 2006 at the Wayback Machine. ↑ "Top Story – 2001 Antarctic Ozone Hole Similar in Size to Holes of Past Three Years, NOAA and NASA Report – October 16, 2001". www.gsfc.nasa.gov. Retrieved 2010-09-16. ↑ "NOAA News Online (Story 2099)". www.noaanews.noaa.gov. Retrieved 2010-09-16. ↑ "EIA – Emissions of the Greenhouse Gases in the United States 2005". www.eia.doe.gov. Retrieved 2010-09-16. ↑ "Ozone Secretariat 25th Anniversary web page". Ozone.unep.org. ↑ Canan, Penelope and Nancy Reichman (2013, forthcoming), "The Montreal Protocol" in J. Britt Holbrook (Chief Editor) Ethics, Science, Technology, and Engineering: An International Resource, 2nd Edition, Thompson Learning. Downie, David (1999). “The Power to Destroy: Understanding Stratospheric Ozone Politics as a Common Pool Resource Problem”, in J. Barkin and G. Shambaugh (eds.) Anarchy and the Environment: The International Relations of Common Pool Resources. Albany: State University of New York Press. David L. Downie (2012). “The Vienna Convention, Montreal Protocol and Global Policy to Protect Stratospheric Ozone”, in P. Wexler et al. (eds.) Chemicals, Environment, Health: A Global Management Perspective. Oxford: Taylor & Francis. Downie, David (2013) “Stratospheric Ozone Depletion.” The Routledge Handbook of Global Environmental Politics. New York: Routledge.